Pat Morita would receive an Oscar nomination for his portrayal of Mr Miyagi, and The Karate Kid is very much his movie, a low-key production that would capture the hearts of a generation. Morita was a comedian most famous for his perfunctory role as Arnold in 1950’s nostalgia sitcom Happy Days, and although there are flashes of his comedic qualities, and just a smidgen of the Xenophobic here too, his is a performance of great depth and adaptability, bringing humanity to a character who might otherwise have been played with trite predictability. It’s amazing to think that Morita was only 43 when he played the wizened handyman who would change the life of one young boy forever. For once we were given a performance that fed off stereotypes in the most positive sense. Above all else, the squat native of Okinawa commanded our respect. 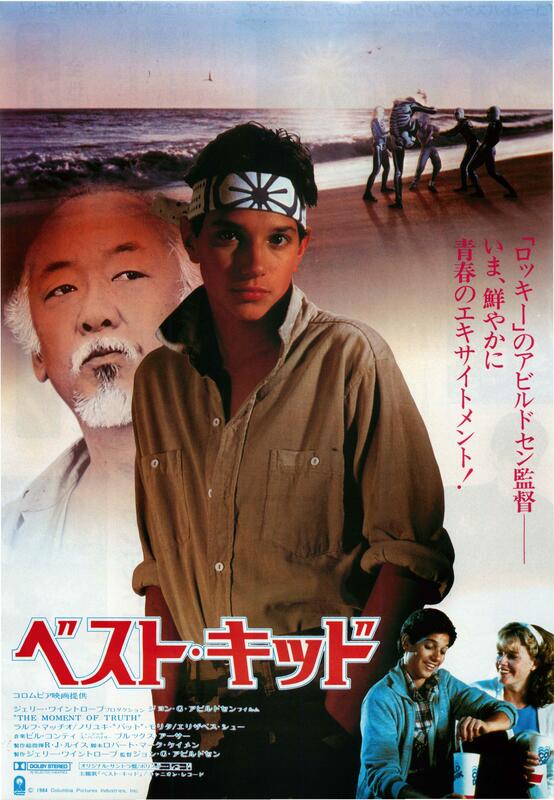 There are superficial aspects to the The Karate Kid that are almost guaranteed to inspire derision, but there is much more to this movie than initially meets the eye. Legendary film critic Roger Ebert once wrote that he was dreading the prospect of sitting through a movie with such an inane title, but was pleasantly surprised by what he saw as a wonderfully crafted morality tale. 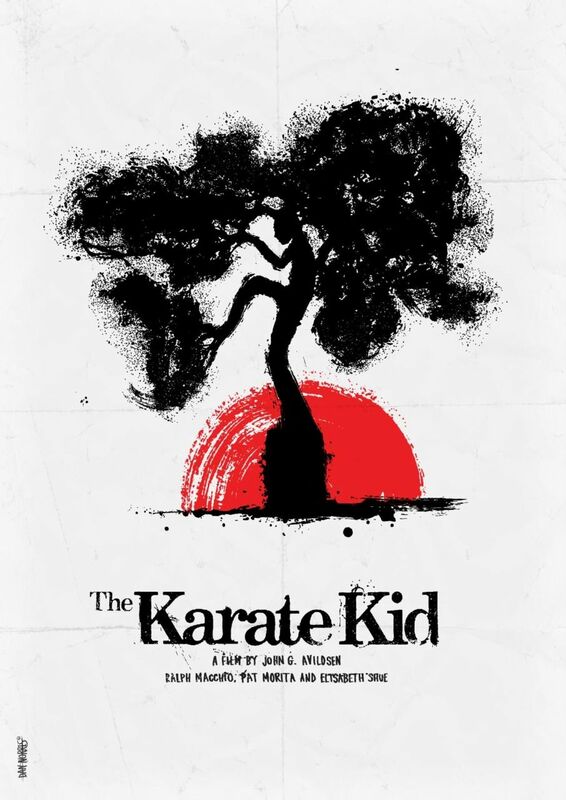 It is this kind of cynical first impression, even from the most willing of movie fans, that kills The Karate Kid for some, but let’s not forget, this is a kid’s movie first and foremost, and hokey titles and sweeping stereotypes are all a part of its marketing formula. Those who watched this movie as a child will invariably attest to its unique charm, while those who dismiss it are generally people who came to it late and find it impossible to look past largely peripheral ethnic crimes such as the portrayal of a Japanese man sitting around trying to catch flies with chopsticks. Mr. Miyagi: Man who catch fly with chopstick accomplish anything. Okay, so the movie can come across as a little patronising, especially when viewed through today’s sociopolitical lens, but some of those convoluted sequences prove to be the most memorable, and are in fact key to its success. 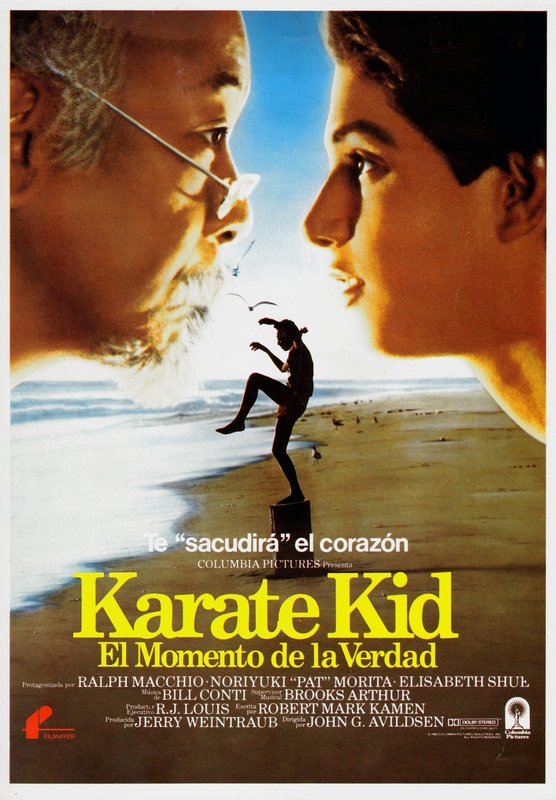 Those scenes in which Mr. Miyagi puts surrogate son Daniel through his paces by working him to the bone are particularly effective, and it is credit to director John G. Avildsen and the actors involved that they were able to use those contrivances to appeal to its target audience, communicating the kind of genuine emotion that has permeated throughout the generations. Phrases like ‘Wax on, wax off’ have become the stuff of lore, while images such as Daniel’s gimmicky crane kick were allowed credence by a screenplay of wonderful craft. The movie, as Miyagi himself will attest, is about finding balance. 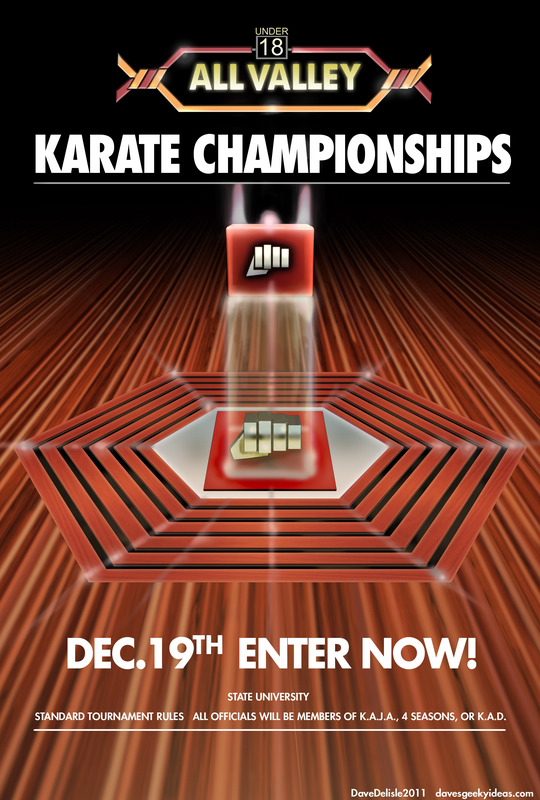 Daniel LaRusso is a fatherless teen who moves to a rundown area of California, only to cross paths with a group of affluent bullies whose karate training adheres to decidedly more Western Philosophies. 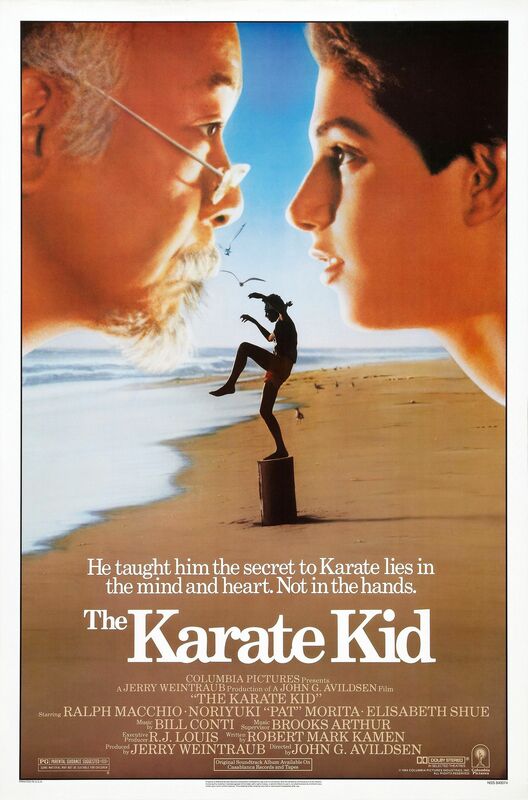 During the 1980s, Karate was every boy’s favourite, probably most short-lived fad, and when Daniel arrives in town that certainly seems to be the case with him until fate determines otherwise. That fate lies in local cutie Ally, and the resulting jealousy of her ex-beau Johnny, whose ‘Strike first, strike hard’ motto leads Daniel and his unwilling advocate to the Cobra Kai dojo and twisted Vietnam veteran John Kreese. Actor Martin Kove oozes malevolence as the smug and irrepressible Kreese – the perfect foil for Miyagi’s immovable pacifist – and it is his emergence that finally convinces the old man to fight Daniel’s corner, although not in the way his querulous student had perhaps anticipated. John Kreese: We do not train to be merciful here. Mercy is for the weak. Unlike most action stars of the 80s, Miyagi is not cut from granite. He does not have the ability to snap a man’s neck like a twig, nor does he flex his biceps and reel-off heartless wisecracks to anonymous villains. The reason for this is that anonymous villains have families too, and Miyagi’s philosophy is that we learn to fight so that we don’t have to— quite the refreshing notion for a movie released in Reagan’s America, a time when Japan were on the rise economically, the sudden influx of Japanese products leading to the kind of xenophobia that would find its way into the subtext of movies such as Ridley Scott’s Blade Runner. But the movie isn’t all about Morita. In spite of his star turn, the Karate Kid’s true power lies in the unlikely pair’s onscreen chemistry. Ralph Macchio will never be remembered as an actor of any real prominence, but he is perfect as the gangling LaRusso, a petulant, good-natured kid who earns the privilege of Miyagi’s long-dormant combat experience and all that it entails. Daniel is all pugnacious charm – cutesy enough for the teenage demographic, but determined enough to bring plausibility to his meteoric rise to All State Karate Champion, overcoming a whole gang of physically superior foes who employ every trick in the book to quash his hard-earned catharsis. In hindsight, Daniel’s gang of leather-clad antagonists seem antiquated. This was before guns were rife in the classroom, a time when a roll in the baseball bunker after school was the most kids had to fear. Still, Johnny (William Zabka) and his buddies are iconic 80s villains, kids who Miyagi sees as misdirected. Kreese is the problem, a fact that he quickly identifies, and through Daniel’s underdog spirit they too learn the error of their master’s ways, the bitterness of his suckled teat suddenly becoming apparent. What LaRusso and Miyagi have cannot be built on fear, only trust. What makes the movie’s central relationship so special are the parallels the two characters share. As fun as it may be to view Miyagi as a flawless, mystical figure, that alone is not enough to establish the kind of onscreen bond that elevates the movie above your typical mawkish fodder. For the majority of the movie, Miyagi plays the level-headed yin to Daniel’s frustrated yang, but on closer inspection he faces many of the same problems his student does. Mr. Miyagi: Better learn balance. Balance is key. Balance good, karate good. Everything good. Like Daniel, Miyagi is a fish out of water, squirrelled away in his garden idyll and plunged into an alien environment at pains to accept him. This is made apparent in a particularly corny scene in which Miyagi clears his car of beer bottles with a shattering blow that leaves his drunken tormentors shaken. But as hackneyed as that moment may seem, it serves its purpose in strengthening their alliance, and perhaps gives the Miyagi character a vicarious reason for helping the stranger who will inevitably become his best friend. Bonzai trees, nature retreats and insect sports are all coping mechanisms that ultimately serve them both, and it is this sanctuary that allows Daniel the space to understand the true value of his sensei’s teachings, helping him to see marital arts not as a tool of ostentation, but as a personal philosophy that is relevant to all aspects of life. It’s not easy, and Miyagi’s flirtation’s with distrust in a series of scenes that see Daniel worked to the bone without explanation are all a part of the hard-earned process that will not only learn Daniel the skills of his master’s family heritage, but will also teach him patience in a situation where a young boy’s first instinct would be to lash out. As Daniel’s relationship with Miyagi grows, we are shown a different side to the pseudo-ominous Japanese stereotype, one that runs much deeper than clipping precious plants or procuring magical herbal potions. In a scene that producers originally banished to the cutting floor, we see a drunken Miyagi as a fallible character dealing with his own sense of personal loss, mourning the death of his beloved wife with a recklessness usually reserved for his protege. This is a crucial scene in the development of the movie and its central characters, and one that director Avildsen fought tooth and nail to salvage. Here we see surrogate son as surrogate father, Daniel realising that his prudent guide is not as impervious as he or his audience may have imagined. In the end, it is Miyagi’s weakness that allows Daniel to realise certain truths about life. Before this moment he is very much under Miyagi’s impermeable wing, and it is through his realisations that he is finally able to step out from his protector’s shadow and find the balance that has so far eluded him. I love this film so much.I have ever since I discovered it when I was younger.The story is actually deeper than you would think.Daniel is a new guy at school.He finds it hard to fit in so he decides to learn Karate.He wanders into the WORST dojo ever and feels even worse.But then , he meets Miyagi.I think that it is their relationship that makes this movie so great.It is quite touching as Daniel finds a father figure and Miyagi a son in some ways.Miyagi seems like a loner too and this makes them similar in a way.Maybe I am reading WAY too much into it lol!Anyway, the ending is superb and it is a feel good movie which never disappoints! !Great review! You’re not reading too much into it at all. On the contrary, you have tapped into the movie’s key elements and what makes it such a joyful watch. It’s a miracle that something with such a silly title could prove to be such a great movie. I’m assuming the director pitched the idea and then came up with a title that would please producers. Today, it seems like they come up with a silly title first, and then write a movie based on its marketing value.